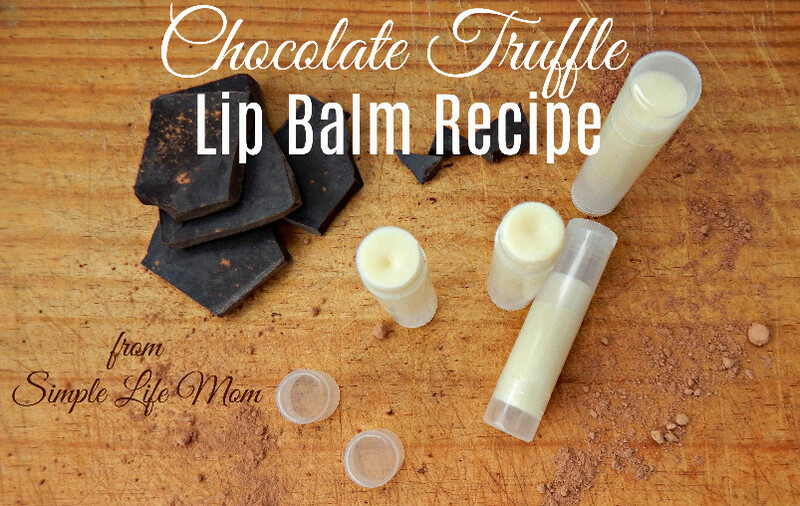 Following this Chocolate Truffle Lip Balm Recipe is easy, and is a great craft that any beginner to homemade products can make. 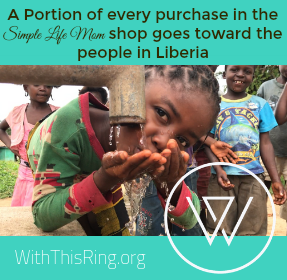 Plus, lip balms make wonderful gifts. I’ll walk you through step by step how to make these for yourself (feel free to lick your lips), your family, or friends for the holidays. 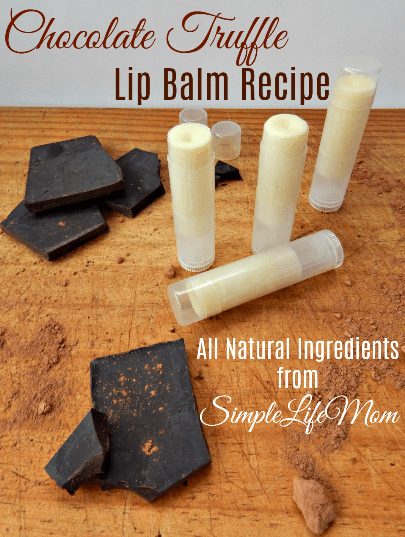 This lip balm recipe smells like chocolate truffles simply by using natural and healthy ingredients. The trick? Combining cocoa butter with vanilla oil! It’s that simple, but makes an amazing natural scent! Before I lay out the recipe, I want to give you the ingredient list. As always, I try to simplify healthy recipes, so this has only 5 ingredients. You don’t any more. Cocoa Butter – Cocoa butter gives this a cocoa scent and helps to harden the lip balm to a nice and creamy consistency. Shea Butter – Shea butter adds the creaminess that you need in a lip balm recipe. It helps to coat and protect your lips from the sun and winter dryness. Bees Wax – beeswax helps the consistency of the lip balm, a well as creating a coating to help protect your lips. Sweet Almond Oil – sweet almond oil can be substituted with avocado oil, grapeseed oil, or apricot kernel oil. I don’t like to use olive oil because it tends to go bad before other oils. Vanilla Oil – Vanilla oil is often portrayed as vanilla essential oil. This link is to one that is an oleoresin (like frankincense). Click here. You can pour the lip balm into lip balm pots like these, or lip balm tubes like these. You can also get something like this crafting tray to make pouring easier. The easiest way to make this chocolate truffle lip balm recipe is to boil water in a sauce pan and place a bowl or glass measuring jar in the hot water to melt the ingredients. Add the beeswax, cocoa butter, shea butter, and sweet almond oil to the double boiler and stir on and off until everything is melted. Remove from heat and add vanilla oil. ***TIP*** When filling lip balm tubes, fill until they almost overflow. The lip balm will shrink as it cools and can leave a hole down the middle. But it’s just cosmetic, so don’t stress if that happens. It’s hard to get them full enough without them overflowing. Create a double boiler by placing a bowl or glass measuring jar in boiling water. Here’s another recipe for Herbal Lip Balm, where you can infuse herbs into your lip balm. Is there a replacement for vanilla oil? I have everything but that. Thanks. The combination of vanilla oil and cocoa butter is really what gives it that decadent truffle scent. If you leave it out it will still have a cocoa scent though. HI! Love this recipe, but in the post you mention a crafting tray, but there is no link nor is there a photo…could you provide the link, please? Thank you for all of these wonderful recipes and for giving of your time to research and post!!! There are a number of options, but this one helps line them up and prevent spill since pouring can become tedious if you’re doing a number of them. Thanks for asking. Unlike most essential oils, true vanilla is water rather than oil soluable. Thus I don’t use it in my products. Instead, I make vanilla infused oils. I have two I try to keep on hand-almond oil and jojoba wax. I learned this trick from Andrea Butje from the Aromahead Institute. Get a bottle of the oil you want to infuse and drop some vanilla oleoresin into it, enough to make a quarter sized blob on the bottom. Leave it for a week or two. Voila! Vanilla scented oil. The beauty of this trick is you can refill the bottle and let fresh oil infuse since the oleoresin doesn’t dissolve in the oil. Or you can get a vanilla bean, cut it in half and leave it in the oil, although you should remove and discard the bean when you’re happy with the scent. Works quite well. One of my favorite lip balms (aside from one very similar to this truffle recipe) involves the vanilla scented oil, steam distilled lime (so it’s not phototoxic), cocoa butter and as fragrant a coconut oil as I can get. Both very yummy! Yes, what passes for vanilla essential oil these days is exactly that. 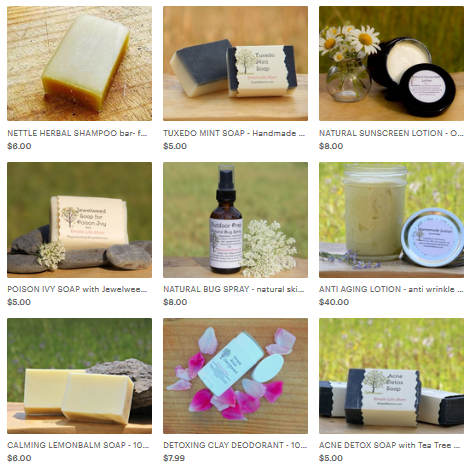 I used to get very upset at product mislabeling, but I’ve found a few companies that are very knowledgeable and explain their process exactly. If they don’t know, then they’re a middle man and you could be getting a fragrance oil. Vanilla bean prices have sky rocketed this year so purchasing a small vanilla oil bottle can be just as frugal as buying the beans and oil at times. A pure oleoresin is super expensive!! This sounds lovely, thanks for sharing the recipe! Since Cocoa butter contains arginine, it would be prudent for people with herpes cold-sores to avoid its use on their lips, or discontinue it immediately when they feel one coming on. Instead I put lemon balm and calendula oils in my lip balms, which seem to help the herpes virus from surfacing, and heal them quickly if they do appear. How many lip balms does this recipe yield? Thanks! It makes about 20 tubes, depending on the size of your tubes. It’s about 4 liquid ounces if you’d like to divide that into the size of tubes you have.